President George W. Bush delivers his annual State of the Union address to Congress and the nation. 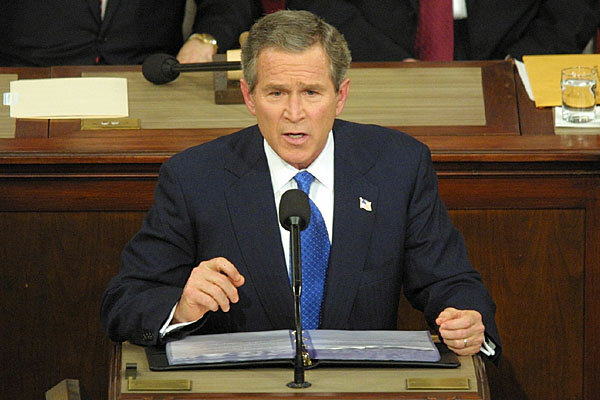 January 28, 2003 - President George W. Bush delivers his annual State of the Union address to Congress and the nation. Mr. Bush vowed to keep up pressure on Iraq to disclose its weapons of mass destruction program, and vowed that " America's purpose is more than to follow a process -- it is to achieve a result: the end of terrible threats to the civilized world. All free nations have a stake in preventing sudden and catastrophic attacks. And we're asking them to join us, and many are doing so. Yet the course of this nation does not depend on the decisions of others. (Applause.) Whatever action is required, whenever action is necessary, I will defend the freedom and security of the American people."